Once again in the past week beards have made the headlines…and for all the wrong reasons. The Independent carried a story titled ‘Do beards really contain as much faeces as a toilet?’. For the Daily Mail the question was ‘how filthy is your beard? ‘Yes’, cried the Huffington Post, ‘our beard might be as dirty as a toilet seat’! The source of the controversy was a claim apparently made on a Mexican website, that beards can actually harbour more germs than the average toilet. Microbiologist John Golobic was quoted as saying that the ‘degree of uncleanliness’ was such that if the same levels were found in a supply of drinking water it would be turned off. Hipsters, Santa Claus, and other beard wearers, he suggested, should wash their hands frequently. As quickly as the beard was being accused, a rush of pogonophiles emerged to defend it. Many pointed out that the same germs inhabit the skin on the face, and pose no risk to health. But this latest attack on beards is seemingly part of an emerging trend. Over the past few weeks several articles have appeared to encourage the move back to a clean-shaven look. Back at the start of April, CBS posed the question ‘Are Beards Bad for You’, quoting a New York physician as saying that they harboured bacteria, and advising men to wash their beards regularly. Even in last Wednesday’s Metro, for example, is a (albeit light-hearted) list of ’11 Reasons Beards are Wrong’. These range from the danger of confusing babies to making the wearer look older (or, perish the thought, resemble a Hipster) even to deceiving people and being unhygienic. 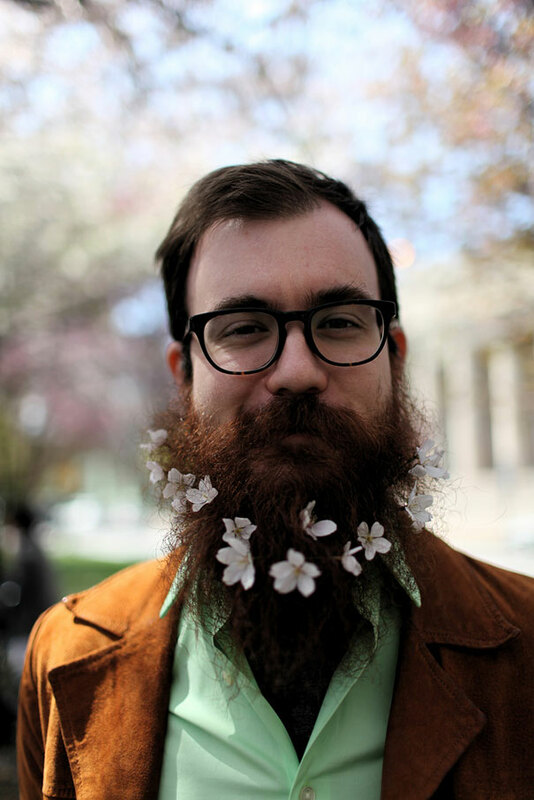 How long this current beard trend will last is a burning issue for journalists. This time last year came a slew of articles all confidently asserting that ‘peak beard’ had been reached; the same claim was being made in the summer of 2013, when the demise of facial topiary was first mooted. So far the beard has proved stubbornly resistant to attack. Indeed, if anything, the anti-pogonotomy trend has continued to grow. There is little evidence of men beginning to shave off their beards. In fact there has been a noticeable rise in products for beard care in the advertisements sections of men’s publications like GQ. It seems that, for the first time in the last few decades, the beard may become more than a passing fad of fashion. It is interesting to note, though, that, just as there have always been beard trends, so have there always been detractors. There have always been those for whom facial hair is anathema. Often, when beards have apparently been most popular, some have sought to bring about their demise. In fact, peering back through history the parallels with the recent attacks on facial hirsuteness are often striking. Shakespeare, for example, although a poster boy for the pointy goatee, allowed his characters to vent their spleen upon the hairy face. The character Beatrice in Much Ado About Nothing exclaims ‘Lord! I could not endure a husband with a beard on his face: I had rather lie in the woollen’! 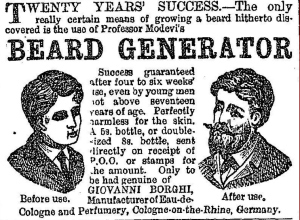 In the eighteenth century facial hair fell spectacularly from favour. ‘The caprices of fashion’ wrote William Nicholson in 1804, ‘have deprived all the nations of Europe of their beards’. The face of the Georgian Beau Monde was clean-shaven, smooth and elegant, reflecting new ideals about politeness and appearance. 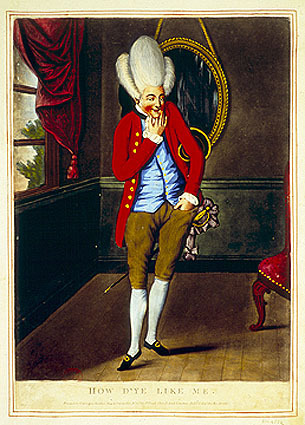 To be stubbly was considered vulgar. The Whig politician Charles James Fox was lampooned in satires for having a heavy growth of stubble; in fairness this was a man whose own father had described him as resembling a monkey when he was a baby! How would our perceptions of Cameron, Clegg, Miliband et al be affected if they had appeared on televised debates sporting full Hipster beards? It’s not an attractive thought I confess. The tax levied on beards by the Russian monarch Peter the Great in the eighteenth century is often cited. Peter was keen to modernise his nation and saw the beard as a symbol of earthy roughness – the exact opposite to the image he wanted to portray of a modern, European nation. This seemingly was not the last tax on facial hair though. In 1907, a report claimed that a member of the New Jersey state legislature had introduced a bill for a graded tax on facial hair. The unnamed politician claimed not only that men with beards had something to hide, but had ‘base and ulterior motives’ for growing them. It was bearded men, he claimed, who had recently carried out a series of notorious murders. What further proof was needed? Perhaps more striking was the graded scale of the tax. For an ‘ordinary beard’ the tax was levied at $1 per year. This was fairly straightforward. But, from then on, things got a bit strange. 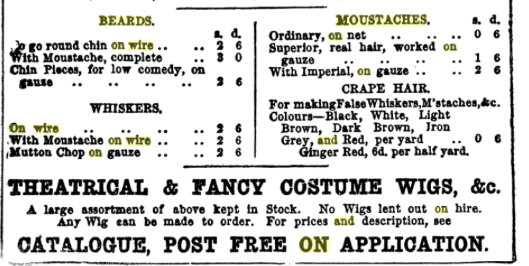 For those men whose whiskers exceeded six inches long the charge was $2…per inch. A bald man with whiskers was punished to the tune of $5, while goatee beards were clearly high on the undesirable list, coming in at a hefty $10 levy. The final (and rather inexplicable) stipulation was that, if any man sported a ‘red beard’ (i.e. ginger), an extra 20% was chargeable. What happened to the bill (and indeed whether it was ever meant to be a serious piece of legislation) is unclear. Some feared that the trend for facial hair might lead to the weakening of British moral fibre! In 1853 a barber calling himself ‘Sibthorp Suds’ complained that the “movement for German beards and Cossack Moustachios” would lead to nothing less than a “farewell to the British Constitution”. If this continued, he argued, he and others like him should be entitled to “‘demnification”! 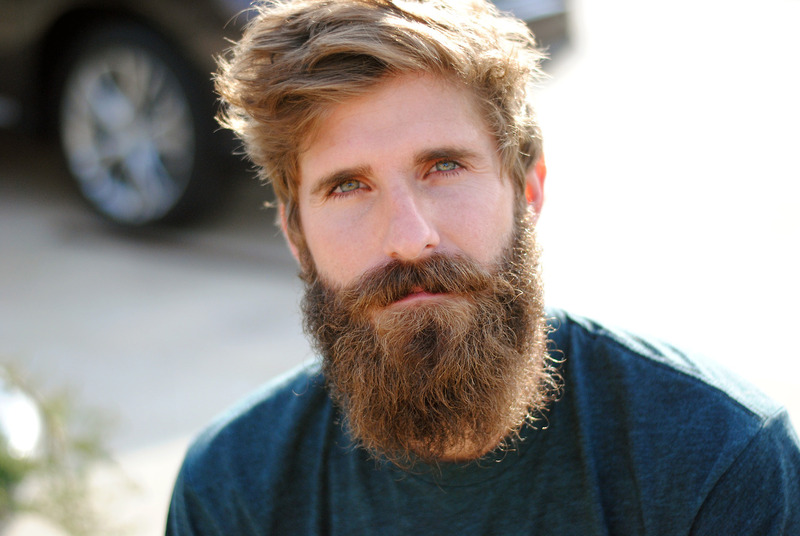 Health and hygiene issues surrounding beards have also long been a bone of contention. In the 1660s the English churchman and historian Thomas Fuller was referring in print to the beard as “that ornamental excrement under the chin”. Sound familiar? 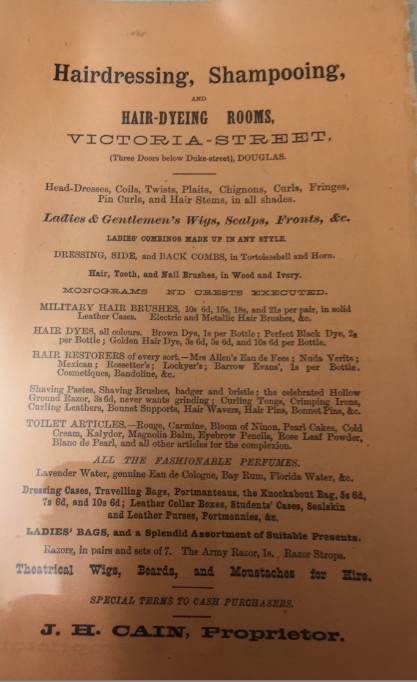 Even as the Victorians were in the grip of a ‘beard movement’ in the mid nineteenth century, a raft of claims were being made about how healthy the beard was, as well as being the ultimate symbol of male authority. 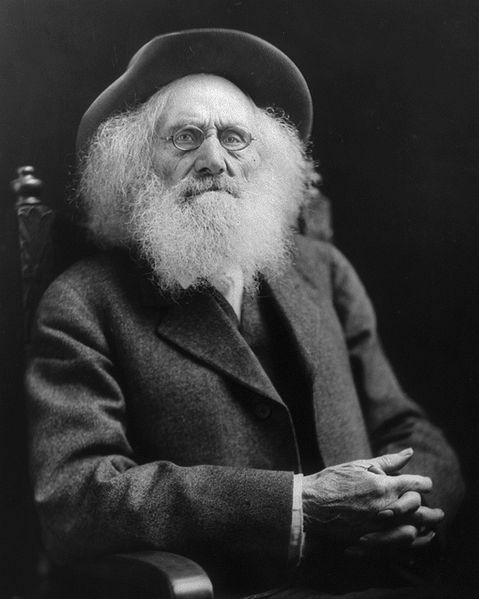 ‘The Beard that has never been cut is beautiful’ opined one author in ‘The Crayon’ periodical. Not only that, the beard protected men from infections of the nose and throat by trapping bacteria before they could enter the mouth. But others were swift to cry down the beard. If facial hair could filter germs, might it not also act as a magnet, which merely collected them around the face, where they could do most damage? Keeping the beard clean was certainly a consideration. In Cardiff in 1870 a barber prosecuted for shaving on a Sunday (against the law! ), argued that he was doing a service since a man attending church with a dirty beard was a blackguard. All of this raises questions about why some people apparently dislike beards so much. They clearly have the power to be extraordinarily divisive. Cleanliness – or otherwise – is clearly one issue. Another is that of the element of hiding, or disguise. Some simply dislike the aesthetics of the beard. It will be interesting to see whether, by 2016, the decline of the beard will have begun. Whenever (indeed if!) this occurs, it will simply be the passing of another episode in the chequered love affair between man and his facial hair.